Do a quick scan of the journal Applied Physics Letters today, and you’ll find that researchers from Belarus and France have fabricated an anti-reflective coating made from sucrose and modeled after moth eyeballs. It could be manipulating microwaves one day, but right now, it’s just incredibly neat. Though we usually see them clustered around light bulbs, moths spend most of their lives out in the darkness surrounded by creatures that want to eat them. This means that it is to the moths’ advantage to take in as much light as they can and give none back. A moth’s eye, close up, is covered with tiny bumps. These bumps change the eye from something smooth and reflective into what’s called an continuous refractive index gradient. When light hits a clear object, from plastic to glass to water, it bends. This is refraction. If it hits any of those objects it bends suddenly, which is why a straw placed in a glass of water appears suddenly bent out of shape. Instead of suddenly bending light, a moth’s eye bends it slowly and smoothly bends, focusing it into the eye, and reflecting no light back out into the world. That’s why scientists from the Research Institut for Nuclear Problems of Belarusian State University and the Institut Jean Lamour-Université de Lorraine picked moth eyes to model their anti-reflective coating after moth eyes. And why make these things out of sugar? Sugar is cheap, and it’s also carbon-based. First the researchers made small beads of sugar and exposed them to high temperatures, but without oxygen. 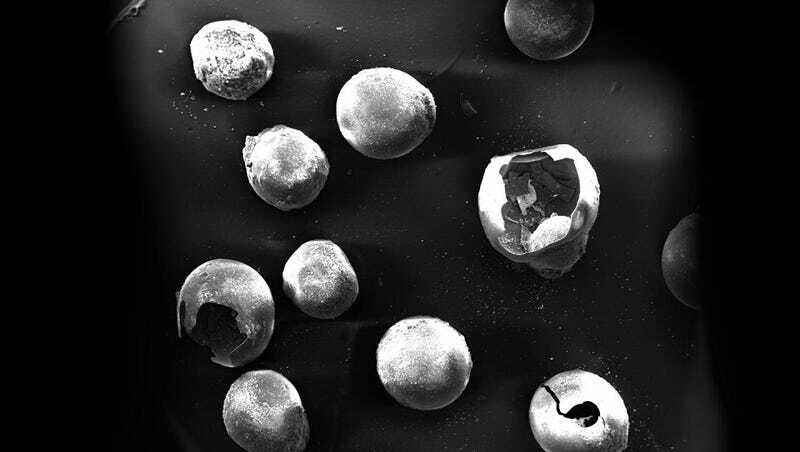 The beads couldn’t burn away, but the outside could turn to blackened carbon while the inside dissolved away into gas, leaving carbon spheres. When the charring is finished, the researchers could just sit back and let the beads organize themselves—a process they point out we could imitate at home. We can try this part of the experiment at home. Take a group of spherical sugar sprinkles and pour them over the bottom of a glass or other container. If they’re identical, and you make sure they’re only one layer thick over the bottom of the glass, they should fall into a roughly hexagonal pattern. The charred sugar beads do the same, falling into a pattern somewhere between interlocking hexagons and squares, depending on how symmetric the beads are. The size of the beads causes the effectiveness of the absorption to vary—with the ideal size being about 12 millimeters in diameter. These absorb microwaves the way moth’s eyes absorb visible light. The ability to absorb these wavelengths so completely may one day lead to coatings that allow planes to fly overhead without showing up on radar. Beyond that, it may even be used to manipulate microwaves instead of simply absorbing them—just by using charred sugar.